← Are Wild Pigs a Threat to Me or My Dogs? 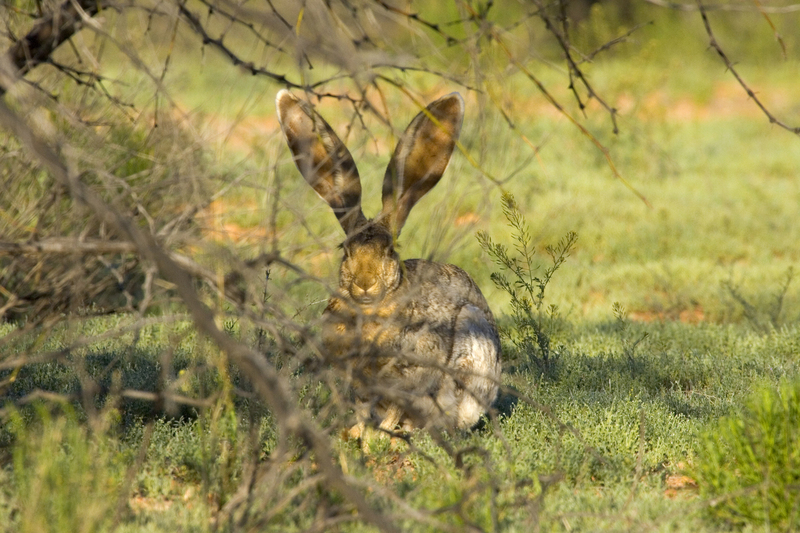 Slingshots may only be used to take nongame birds and mammals, and jack rabbits are not included in that list (USFWS photo). Answer: Slingshots may only be used to take nongame birds and mammals (California Code of Regulations Title 14, section 475). However, the only nongame birds that may be taken by any method are English house sparrows and starlings (FGC, sections 3800(a) and 3801). There is also a crow hunting season, but crows may only be taken by shotgun, falconry or archery (CCR Title 14, section 485). Common nongame mammals (“varmint” is not a term used in Fish and Game law) that may be taken include coyotes, bobcats, opossums, ground squirrels and orange-belly marmots. Take of bobcat requires possession of a bobcat tag (CCR Title 14, section 478.1). Rabbits and tree squirrels are game mammals, and their take with a slingshot is illegal. Nongame mammals are those species not otherwise categorized in the law as resident small game (CCR Title 14, section 257), big game (CCR Title 14, section 350) or fur-bearing mammals (FGC, section 4000). The complete Fish and Game Code is available online at: http://dfg.ca.gov/enforcement/. Keeping lobsters whole for the trip home? Answer: No. Lobster must remain in a whole, measurable condition, until being prepared for immediate consumption (CCR Title 14, section 29.90(e)). Who is authorized to take nongame animals causing property damage? Answer: Nongame animals causing crop or property damage do not require a depredation permit to be taken by the landowners and/or the specific people they have designated to work on their behalf to eliminate the offending animals. On public land, or in situations where the take is not for depredation by a landowner or agent, a hunting license is required. Special precautions should be taken to ensure that any animals causing property/crop damage are not endangered species. If someone shoots/kills an endangered species, they will have to have evidence of the property damage or face significant fines and penalties. In order to be considered an “agent” of the landowner, you will need written documentation from the landowner stating you are taking the nongame mammals on his or her behalf for depredation purposes. This will serve as proof that you have permission to be on private land and will eliminate the need for a hunting license. If you are in condor country, be sure to use non-lead ammunition. For more information on requirements for non-lead ammunition, please go to http://www.dfg.ca.gov/wildlife/hunting/condor/ . Can game wardens check my fishing license by my CDL? Answer: No, you are required to have your actual sport fishing license in possession while fishing (CCR Title 14, section 700) and to present your actual license upon request to any game warden who asks (FGC, section 2012). DFG game wardens do not carry CDL scanners. This entry was posted in Depredation, Licensing/Permits/Stamps/Report Cards, Lobsters, Other, Saltwater Fishing and tagged crustaceans, depredation, hunting, Licenses, nongame, ocean fishing. Bookmark the permalink.